The IAM negotiating committee at Huntington-Ingalls shipyard in Norfolk, VA continues to fight for a first contract for its membership. 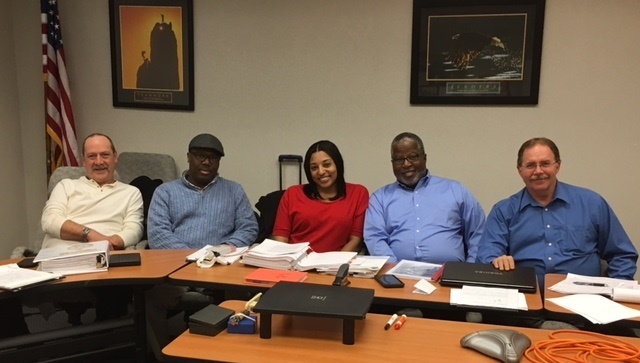 Pictured from left are members Tony Poslik, Samuel L. Lovett and LaTasha Greene, District 74 Directing Business Representative Larry Young and Southern Territory Grand Lodge Representative Joe Greaser. “We emphatically believe we are worth what we are asking for,” says Samuel L. Lovett, a bargaining committee member at Huntington-Ingalls shipyard in Newport News, VA. That was his message to the opposite side of the table this week. Lovett is one of the 185 highly skilled radiological technicians who have been working for a first contract since the group voted for IAM representation more than seven years ago. Larry Young, IAM Directing Business Representative of District Lodge 74, has been with this group from the beginning. He says he couldn’t have asked for a more dedicated committee. After years of watching Huntington-Ingalls file appeals from here all the way to the Supreme Court and back, members are ready for a fair contract. Now it’s down to the details. Proposal after proposal is dealing with the minutiae of the contract’s economic and classification language. And as each proposal crosses the table, workers continue to fight and show resolve, knowing a first contract is the first step to the American Dream. Just like the rest of the bargaining committee, Greene has no intention of backing down. “We are still in this – it doesn’t stop until the contract is signed,” she said. The post ‘We Are Still In This’ appeared first on IAMAW.